Jessie Butash is the Middle School Principal & Director of Teaching & Learning at Mount Saint Charles Academy in Woonsocket, RI. Follow her on Twitter @jessiebutash and check out her Fuse Fellow profile for more information. Fuse RI Cohort 1 alumna Jessie Butash (furthest right) meets and laughs with some of her colleagues at Mount Saint Charles Academy on January 19, 2018. The 2017-2018 school year for Jessie Butash has been one full of embracing change. After four years at Cumberland High School, she joined her colleague Alan Tenreiro as part of a new leadership team at Mount Saint Charles Academy. Her grade level focus now spans the 6-12 continuum, and she is learning more about the private school sector. But when asked about this transition, Jessie frames it instead as a year of realizations and relationships. 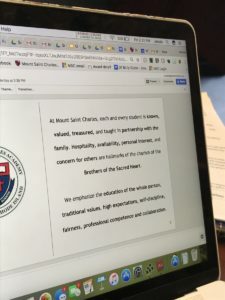 Jessie sees clear parallels between Mount Saint Charles’ vision statement and the power of personalized learning. For Jessie, making personalized learning happen means modeling what she’s asking teachers to explore as much as possible. The other day, she led a 21st century skills training with her staff, building professional learning playlists based on self-assessed proficiency levels. 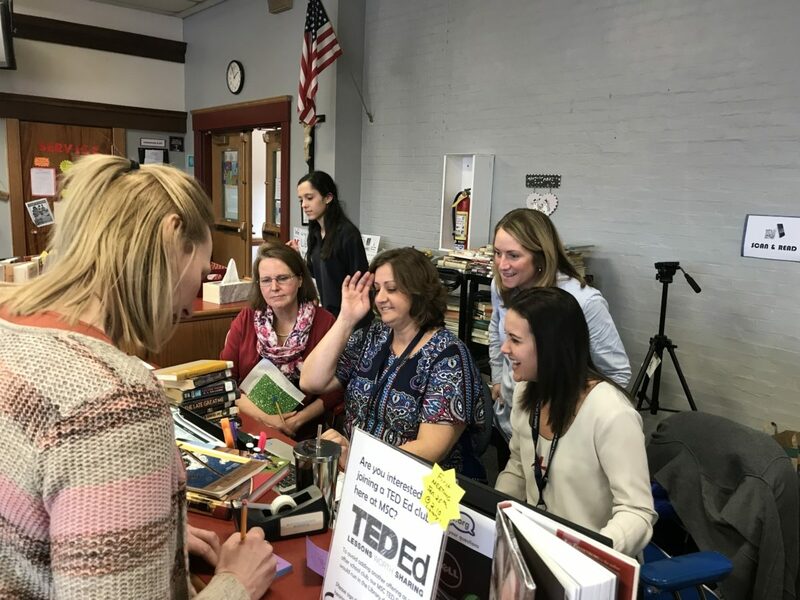 Teachers were able to choose which resources they explored, from breaking down the buzzwords of personalized learning, to understanding potential real world connections. At the root of everything, Jessie and her team prioritize the relationship between quality digital resources, higher levels of Bloom’s Taxonomy, and depth of knowledge. They left the session with a commitment to specific goals for their own pedagogical practice over the next few months. The broadcasters club recorded its first newscast this year in the back of the library. Traditional structures at Mount Saint Charles are also opening themselves to reinvention. 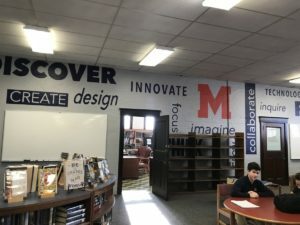 A plan to redesign the library environment is underway, under the guidance of Library Media Specialist Kristin Polseno. There’s an entrepreneurial club and a broadcast crew that may become a full-fledged class next year. Kristin’s also reimagining the back room of the library, currently used for storage, into a coffee shop for students to access before, after, and during the school day. With the influx of new ideas, teachers are feeling more confident to try new things. 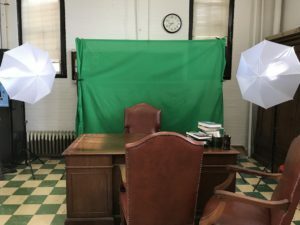 After some trainings with Jessie and Kristin, Jill Torres, a high school Spanish teacher, facilitated a Mystery Skype with a class in Spain, which felt exhilarating and mind-opening for teacher and students alike. Kristin Polseno, Library Media Specialist at Mount Saint Charles, envisions the library as a space where students can collaborate and create. Jessie has spent much of this year reflecting on theories of change, ruminating on questions like: “What is change and what should the process look like?” “How do I inspire and sustain lasting, complex change?” She’s had many frank conversations with her new team of leaders and teachers, acknowledging that times have changed. In her words, “many of the educators I work with were hired for a completely different job than they’re expected to do today. Where should the starting point of this work be to shift their thinking in a way that respects all of their experience and talent?” Right now, they’ve determined that critical and higher order thinking truly is the best entry point for them. Jessie has always been a leader who thrives on collaboration, and was thinking about how to break down barriers well before the Fuse Fellowship came her way. She’s the leader of Fuse Classroom, a spinoff program focused on connecting individual teachers and coaches across Rhode Island. For her, Fuse was a way to see different districts in action and appreciate different paths to starting blended learning. She noted that so many things can be different across our state – priorities, management styles, the sense of urgency – but that our similarities are the most powerful resource.